In Tumbes, the climate is tropical, hot all year round, with a hotter and rainy season from January to April, and a dry and relatively cool season from June to November. Usually, May and December are hot months, but with little rainfall. 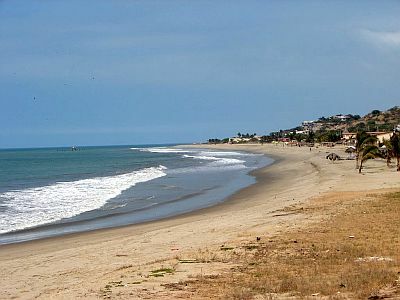 Tumbes is located in the northernmost part of the Peruvian coast, near the border with Ecuador, just south of the Equator, in an area where the cold Humboldt Current arrives attenuated but is still able to influence the climate, making it drier than other areas located at the same latitude. To the northeast of the city, on the border with Ecuador, we find the "Tumbes Mangals National Sanctuary", an area occupied by mangroves, inhabited by birds and crocodiles, while the beaches are found more to the south (see Caleta Cruz, Zorritos, Bocapán). Normally, the rains are not abundant, in fact they amount to about 460 millimeters (18 inches) per year. However, they are quite abundant in February and March, but above all they have a strong variability. There are very dry years, when there is little rain also from January to April, and annual precipitation drops below 100 mm (4 in), normal years, when precipitation is around the average, and very wet years, when the rains become frequent and abundant, sometimes torrential, from January to May (and sometimes also in December). This happens in the years of El Niño, the phenomenon consisting in an abnormal warming of the Pacific waters west of South America, and which in this area has significant effects. In the most intense years of El Niño, the rains increase considerably, the rainy season lasts longer and can go from December to June or July, and the temperature in these months increases as well. For example, rainfall in 1983 totalled up to 2,210 mm (87 in), of which 330 mm (13 in) fell in January, when also the temperature reached 37 °C (99 °F), 350 mm (13.7 in) fell in February, 205 mm (8 in) in March, 500 mm (20 in) in April, 490 mm (19 in) in May, 115 mm (4.5 in) in June, and 165 mm (6.5 in) still in July. In 1997/1998, precipitation amounted to: 415 mm (16.5 in) already in December 1997, 470 mm (18.5 in) in January, 730 mm (28.7 in) in February (which 240 mm or 9.4 in fell in a day), 435 mm (17 in) in March, 335 mm (13 in) in April, 180 mm (7 in) in May, for a total of 2,565 mm (101 in) from December to May, and finally no rain in June. In 1998, because of these heavy rains, the river of the same name that passes through the city and flows into the Pacific Ocean, flooded the city. Here, however, is the average rainfall. The amount of sunshine in Tumbes is not very good, however, paradoxically the sky tends to be cloudy especially in the cooler and dry period, from July to September, while in the rainy season, there is an alternation between sunshine and cloudiness. The sunniest month is December, with about 7 hours of sunshine per day. The sea in Tumbes is warm enough for swimming from January to May, while it gets a little cool from July to November; however, at this the latitude it is cooler than in other parts of the world. In the years of El Niño, the sea in this area warms up a lot, so much so that it can reach 29 °C (84 °F) in the early months of the year.